College can be a hazardous place for the faith of young Christians. There are numerous resources that provide wise counsel to the entering freshman. Here are two of the better ones: How to Stay Christian in Collegeby J. Budziszewski and The Fabric of Faithfulness by Steven Garber. Several years ago, writer Timothy Dalrymple distilled several pieces of sage advice from his many years in the academy—at Stanford University, Princeton Theological Seminary and Harvard University—and published them at his blog in “An Open Letter to College Freshman.” All wise counsel for the young collegian as well as the rest of us! Seek wisdom, not merely intelligence. Seek mentors, not merely teachers. Seek the truth, not merely prevailing opinion. Seek answers, not merely questions. Seek betterment, not merely achievement. Seek fellowship, not merely friends. Seek first the kingdom and righteousness of God. 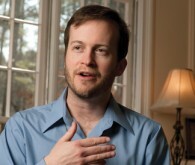 Timothy Dalrymple is managing editor for the Evangelical portal at Patheos.com. He is a graduate of Stanford University, Princeton Theological Seminary and Harvard University. A former elite gymnast whose career ended when he broke his neck in warm-ups for a competition, Dr. Dalrymple has written and spoken broadly on faith and sports issues.